We really don't eat out much, which is partly because we like to cook and eat at home, partly because eating out is pretty expensive in Sweden, and partly, these days, because we have a toddler who doesn't appriciate late dining. But a few weeks ago, we decided to leave the toddler with his grandparents for the night, eat out AND spend the night in a hotel. Very luxurious mini-vacation for us! We chose to eat at Marie Laveau which serves US Louisiana-style food. It's a popular, so make sure to book a table. It's also pretty loud, they have an attached night-club, and it's rather casual. The menu has a lot of tempting things to offer - including frog legs! We decided to stick to two main dishes, and order a lot of sides. I chose a simple steak, and Per went for a gorgeous chipotle-braised pork belly that took a long time to prepare but was well worth the wait. 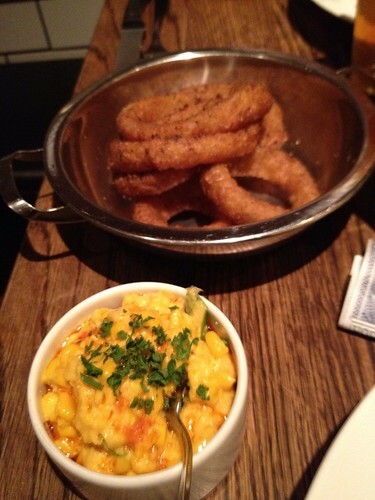 For sides, we ordered a chipotle mayo, spicy mustard, an apple cole slaw, creamed corn with chili oil, roasted sweet potato, pickled okra and fantastic onion rings. For drinks, they have an ambitious beer menu, and Per tried out a few new kinds. I ordered their homemade lemonade which was excellent - I highly recommend that! Neither of us could find room for dessert, unfortunately - maybe next time! Hi, I love your blog :) I regularly follow it and now that I'm planning a trip to Stockholm I'll have to pay extra attention to your recommendations on eating.